Good products have a knack of selling themselves, but there is more to selling a machine than simply letting a customer walk away with it. Kubota Tractor Australia (KTA) are making after sales service a high priority and this discipline is being carried out through their dealerships in the form of a 5 Star Service Programme. Chris Nielsen, National Service Manager, Kubota Tractor Australia spoke on the importance of giving Kubota customers a complete Kubota experience, and how putting the 5 star service concept in place fills that standard. Kubota Tractor Australia are working towards growing their dealerships and implementing a firm level of service criteria that they must achieve in order to operate as an accredited 5 star service business. A 5 star tag improves business principals by offering customers the best possible service standard to the expectation of the market. According to Andrew Dunkley, Principal Dealer of Andrew Dunkley Machinery in Yarram, VIC, being a 5 Star Service dealer has created some sales, but the dealership is primarily based around the service area. Achieving 5 Star Service with Kubota is one way for them to monitor their progress. The Kubota 5 Star Service Programme was began in 2003 when Kubota Tractor Australia saw a need to get dealers focused on running their service workshops as a profitable part of their business, rather then seeing it as a cost centre. Kubota Tractor Australia came up with ideas on what could benefit the customer, the dealership, and the industry, and made these ideas something that their dealerships must have in place, to become a 5 Star rated business. The Kubota 5 Star Service Programme is an opportunity for Kubota dealers to improve their business on a number of levels. A dealership must meet several criteria in order to achieve 5 Star status. These include: staffing, facility, tooling, service vehicles, identification, operations and training. Each dealership must employ a Service Manager, Qualified technicians, and parts staff to meet staffing requirements. Every two years, these elements are self assessed by dealerships and reported to Kubota Tractor Australia. 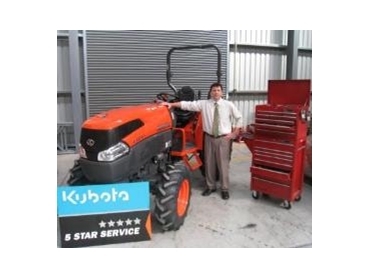 If the self assessed level of service meets the criteria, a Kubota Tractor Australia service representative is sent out to inspect the dealership and make a final assessment on whether or not the 5 Star rating is achieved. Warranty claims have reduced markedly since 2003. Now that dealers have implemented changes to their maintenance areas such as updated tooling, improved workshop facilities and operations, and increased staff training, warranty claims in 2009 are at an all time low. Sales have risen and customer satisfaction has increased during this time. In 2004, two Kubota dealers achieved the 5 star rating; now in 2009 there are 55 Kubota 5 Star Service dealerships in Australia.